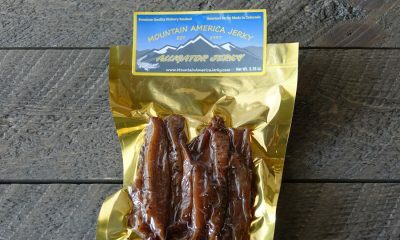 Our Wild Boar Jerky is made from whole muscle boar meat. 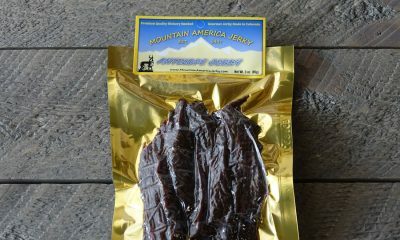 This jerky naturally has a sweet, nutty flavor, which we compliment nicely with a blend of original spices. Wild boar meat is naturally leaner and deeper red in color than regular pork, due to a diet containing acorns, roots and other types of vegetation. Our Boar Jerky is made with 100% solid strips of wild boar meat…no chopping, forming or grinding here; no other added meats. Never treated with growth hormones or steroids. No MSG, nitrates, or other fillers. 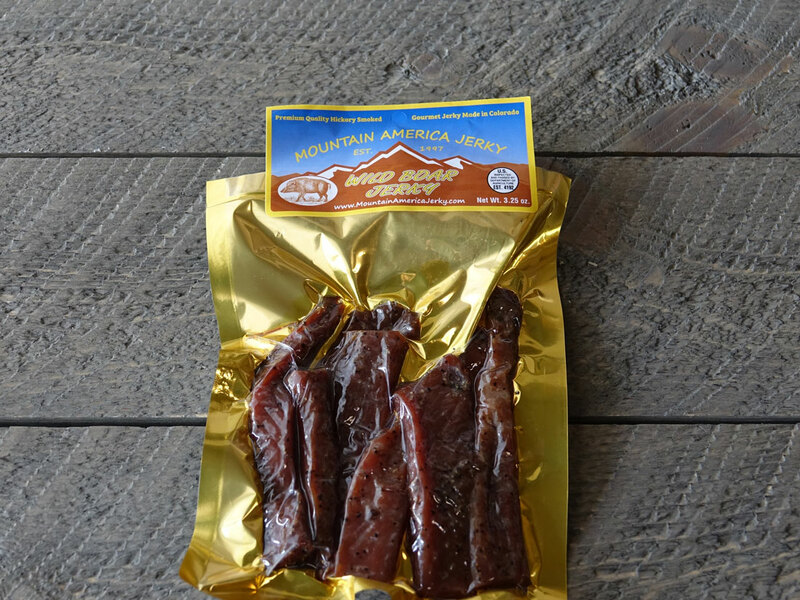 Add a little wild hog jerky to your life with this unique and delicious addition to our exotic jerky lineup. I bought three different kinds of jerky as one of the snacks I was offering my guests on a Game Night. I bought a package of the wild Boar, Teriyaki Beef Jerky and the Sweet and Spicy Bison. The Wild Boar was by far my absolute favorite. Also the favorite of a few of the guests. Everything was devoured that night. It was fantastic! I cannot wait to order it again and I am totally hiding it away from everyone else! I’ve ordered over a dozen times from this place. Normally i stick with the salmon jerky. I love it. I plan on trying all of them at some point. Its just hard not to get the one u love so much. I’ve bought this stuff at least four or five times now and there’s no signs of stopping. This boar jerky in particular is top notch, very chewy and flavorful. I can’t recommend this company enough. (Wild Boar review) Love it….haven’t been disappointed yet with any variety. Love the Alligator and Wild Boar jerky the best. 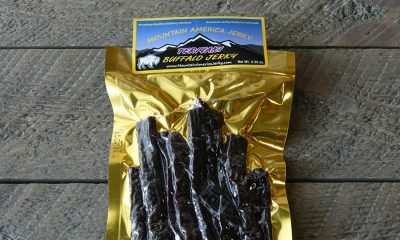 Best jerky buy in the U.S.
(Wild Boar review) The jerky tasted very good. I just placed my third order and plan on placing more in the future. Wild Boar Jerky: This was the first pork jerky that I’ve had. It was every bit as good as beef. 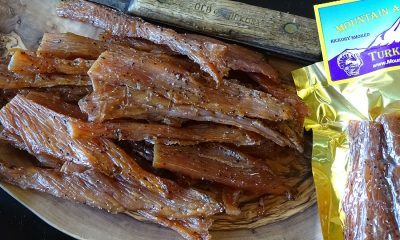 The wild boar jerky has plenty of chew and rich, savory flavor. Not as sweet as the gator jerky, I would almost characterize the flavor as “BBQ like.” Regardless of what you call it, it was very tasty. (Original Wild Boar review) I was debating on whether to use this site or some other ones I found, but after seeing this company’s BBB rating (Better Business Bureau), which is an A+ by the way, I decided to go with Mountain America and I must say that this is some of the best jerky I’ve ever had. Especially the teriyaki salmon! (Wild Boar review) Over several days we sampled them all. My son liked the Boar and Yak and Spicy Beef best. My hubby loved the Teriyaki, Boar and the Yak the best and my Fav’s were the Teriyaki, Spicy Beef and Boar. Wow! It was actually very hard to choose. The Venison was very good too but they all have wonderful subtle flavors. The spicy beef was spicy but good. Read the full review.